Christmas is around the corner, which means it’s time to start busting out tons of merriness. 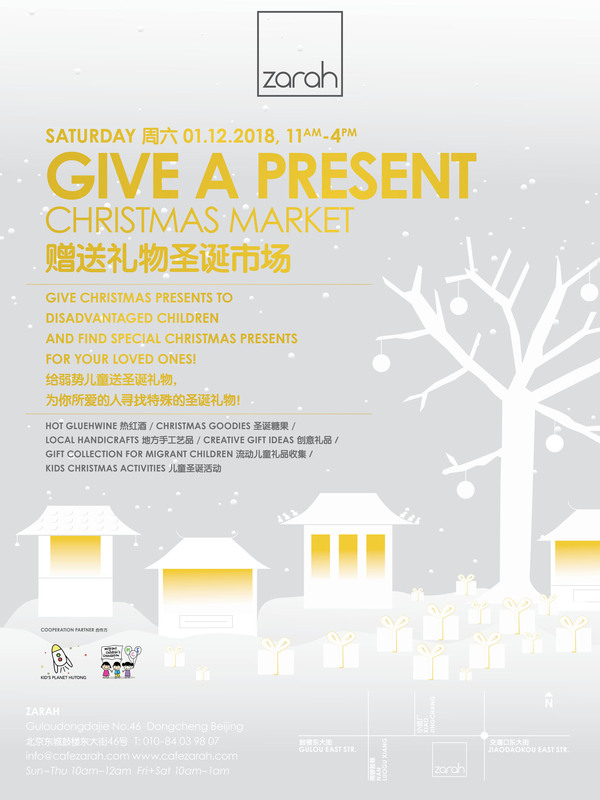 In the Yuletide spirit of love and giving back, Café Zarah are celebrating the festival via a “Give a Present” Christmas Market, which will be coming up on Saturday, Dec 1, at the cafe, providing a great opportunity for some special gift-exchanges. Zarah will be setting up a Christmas tree to collect gifts for children at the Migrant Children’s Foundation (MCF), a Beijing-based NGO that aims to help disadvantaged children from migrant communities. At the same time, you will be able to get special gifts such as home-made jams, chutneys and peanut butters, self-made jewelry, bags and clothes, organic beauty products, and many other special DIY handicrafts. The cafe will also have a kid’s corner where your little ones can do handicrafts and other Christmas activities organized by Kids Planet Hutong. While you come to reclaim the beautiful holiday spirit by showing your kindness and support to the community, you can also feast on Zarah’s freshly baked Christmas cookies, German lebkuchen, homemade waffles, as well as the roasted almonds and gluehwein .